Equality of opportunity should be the goal, not equality of outcome. We are all individuals with different strengths, weaknesses and goals. Peter Grant goes over some of the absolutely insane stuff going on right now. I remember this from when I was a kid. It caused me quite a bit of anxiety then. With the current Tor Books fiasco going on I thought I might point out some alternatives. For those who want to continue reading but not support Tor, and don’t want to do something illegal like torrenting books, there are various places you can patronize. First, Baen Books is a wonderful place. I can’t say enough about them and the goodwill they have engendered throughout the years. They have a Free Library linked where they have some a nice sampling of some of their offerings. These are the full books, not chapter samples, and are available in a myriad of formats, so no matter what type of eReader you have you should be able to download the file and put it right on your device without any problems. Secondly, Baen Books used to put CDs in their hardcover books as a way to encourage a broader readership. The CDs were meant to be shared among fans. You may still be able to find the CDs in your local library. But you can also download them from various sites. The Fifth Imperium has copies of most of the CDs (one of the authors asked that her books not be shown, but you can still find them if you search for them). You can download the ISO.zip files if you want to burn them onto a CD for yourself, or you can download the CD.zip files and simply extract them (which is what I did). There are various formats presented, but some are not in .epub or .mobi, so you will have to convert some of them to your format of choice. This can be done quite easily through the free eLibrary program called Calibre. Between the Baen Free Library and the Baen CDs you will have a couple of hundred free Science Fiction and Fantasy titles to choose from. Project Gutenberg is a site that is actively expanding it’s collection of public domain titles of all different types of works. These are usually pretty well formatted and are in various formats for the different eReaders. Some of the titles I’ve downloaded include E. E. “Doc” Smith’s Triplanetary (of the Lensmen series) and Skylark of Space, Alan Edward Nourse’s Gold In the Sky and Raymond Jones’ The Year When Stardust Fell. There are other Project Gutenberg sites for various other countries as well, since not all countries have the same copyright laws. Phoenix Pick is another SF/F publisher that every month offers a free selection from their catalogue of new and backlist titles. Simply sign up for their monthly newsletter to find out what the featured selection is. I’ve enjoyed the offerings of Nancy Kress, Kevin J. Anderson, Catherine Wells and L. Sprague de Camp. Open Library is another choice, though I have yet to use them. They appear to be a network of libraries from around the country. Would You Do Business With A Company Whose Employee’s Insult You? 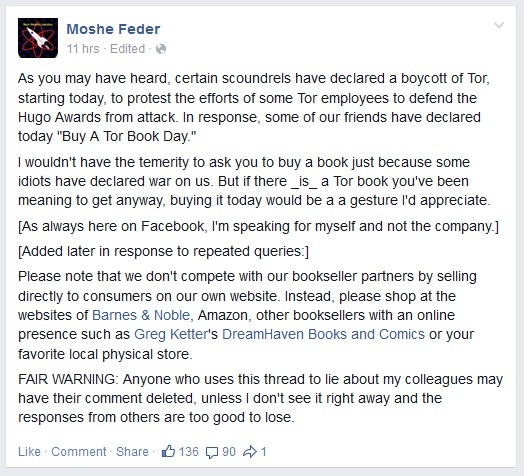 Allow me to link to Peter Grant’s post about this and say that the reason I won’t purchase anything from Tor anymore is because of people like Moshe (and Irene and the Nielsen Haydens). They just can’t stop lying. As Peter Grant points out, that very first sentence is a Frakkin’ Lie! He also seems quite confused as to whether he’s speaking for Tor or just himself with that comment about “Please note we don’t compete with our bookseller partners…” (emphasis added mine). The Sad Puppies campaign was never about attacking the Hugo’s, but rather to bring the Hugo’s back to a more centered point where the stories weren’t there simply because the author fell into a certain category of victimhood or it pushed a certain agenda. It’s about putting a well written, entertaining story out. The story can have a message, but the message shouldn’t be the story. I’m not calling for a boycott. I’m saying I won’t purchase any more books from Tor (or other MacMillan houses) as long as their employees feel free to lie about me, cast aspersions on my character and insult me. I don’t think that’s asking too much. You can do whatever you want, that’s up to you and I really don’t care what you do as long as it doesn’t come back to me. Neuroscientist Margaret Hauri has two children to raise, and she’s on the cusp of a scientific breakthrough. Great story. The best of the Hugo nominations left standing that I’ve read so far. I was a little hesitant at first. The first couple of paragraphs didn’t jump out at me. And one of my greatest fears is being in a conscious but vegetative state, so the initial impression for me apprehension. I’m not much of a horror story reader and that’s sort of where I was thinking this was going. But it’s a very well written story. I identified with Maggie and had an emotional response by the end. The characters weren’t deep, but they usually aren’t in a short story. I have no idea about the actual science behind it, having never taken a formal biology class. But the concept itself seems cool and makes for an entertaining story. The wattpad website screen was formatted well with no obvious errors. The story originally appeared in Galaxy’s Edge magazine. Old California suffers beneath the whip-lash of oppression…But a champion of freedom rides the highways. A deadly marksman and a demon swordsman, his flashing blade leaves behind The Mark of Zorro. An excellent adventure tale. I didn’t realize how similar some of the themes were to the Robin Hood and The Scarlet Pimpernel stories. I thoroughly enjoyed the story. Most of my exposure to Zorro was through TV and Movies before this. I was a little surprised how little a role Bernard actually had. I was also surprised that Don Alejandro was putting pressure on Don Diego since he was considered a successful man in his own right. Sgt. Gonzales was a bit of an enigma to me – should I be rooting for him or not? Capt. Ramon I thoroughly disliked. The ebook from black mask online was horribly formatted. It was a bad OCR that no one apparently decided to proof read. I actually ended up reading almost all of the book in Sigil as I cleaned up the bad OCR. 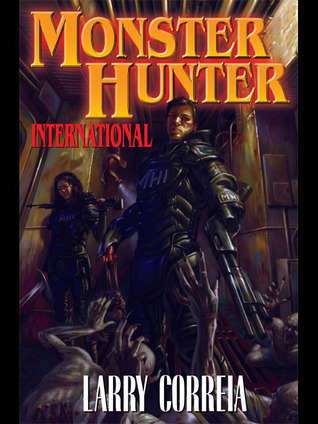 Monster Hunter International is the premier eradication company in the business, and Owen Zastava Pitt — CPA, average guy, and survivor of a brutal supernatural attack — is the company’s newest employee. When MHI takes on a new contract, Owen and the girl of his dreams unwittingly find themselves in the path of an ancient evil. A creature known as the Cursed One has returned to fulfill a centuries old vendetta. And when he does, its the end of the world. Irene Gallo has now made her statement, most likely forced on her from her employer, about her prior statements detailed here. You’ll notice that the only thing she apologized for is hurting people’s feelings. There is no contrition in that statement about the mischaracterizations she set forth. Those were, and are, her true sentiments. I do not expect anything more from her. A hollow apology would be even worse than the non-apology she just made. No More of My Money For You! It would appear the idiocy at Tor Books knows no bounds. As the Nielsen Hayden’s have been railing against the Sad Puppies these last few months (links to original posting in Brad’s blog post) I’ve been willing to give the poor authors and other employees at Tor a break. They really shouldn’t be saddled with the consequences of the actions of a few vocal members of the business. I was still willing to buy books from Tor, just not ones edited by Patrick or Teresa Nielsen Hayden. I was still willing to buy books from DAW even though Betsy Wollheim could use some extra money to buy a clue. However, I’ve reached the end of my rope. Let me introduce you to Irene Gallo, Creative Director at Tor Books (that means she has considerable sway over who and what gets published there) . It’s come to the point where if the leaders of business are willing to crap not only all over the fans they hope to sell to, but also their own authors, with vile and demonstrably false lies and aren’t taken to task for it by their bosses then it’s clear that the business in question holds sympathies with those thoughts. As such, I’ve bought my last book from Tor. I’m done with DAW as well. No More of My Money For You! You’ve made it clear over the last few months you don’t want my money or loyalty, so I won’t give it to you anymore. I’ll buy books with a rocket ship on the cover or Indy, or anywhere else but from you. I’ve got ~1600 eBooks on my computer, and another 400 Dead Tree Books. My little library probably won’t hurt you, but maybe if enough little guys like me all pull together something can be done.